I felt good up to 19 miles then hit the wall at twenty and had to walk to 23/24 but managed to run the last 2 due to having friends / family at the finish. Firstly I feel a bit of a fraud having walked 2 miles and feel a bit disappointed that I couldn't run the whole 26. My actual time was 4hrs 55 mins, which again I was disappointed with. My initial reaction on finishing was "never again" but allready I feel I want another go with the time being a real issue for me. In hindsight I should have completed more longer runs, and only managed to hit 20 miles 2 weeks before the event. The winter is fast approaching here in the UK and will probably look to do another marathon early part of 2009 (April time). What sort of training activity do you recommend during the winter.. since the 7th of this month after 3 days rest I have done a 6, 13, 6, and 9 miles with 1 days rest in between. The poor marathon experience is playing on my mind and feel I should be doing more? Thanks for your running training question. Yes, I do have some advice. First off though, congratulations on making it through your first marathon. A great feat. But yes, it is going to happen, it is going to happen. It is too bad that nobody warned you strongly enough in advance, otherwise it would not have been such a disappointment. Only getting to 20 miles once is not enough. You need to run 20 miles a number of times during your marathon training. Aim for four/five times. One of the secrets to a killer marathon is to have a middle to long distance run in the middle of the week, in addition to the traditional weekend long run. So if you run 16-20 miles in your long run, do a mid-week run of 13-17 miles. Marathon training is really tough. You really need to taper properly before your marathon. General advice is to taper for three weeks. Your 20 miler two weeks before the marathon was definitely too close to the event. Also see the marathon taper page. I can understand you are disappointed and that you want to wipe out the, in your eyes, poor performance, with another race. There is however a lot of merit in not doing a spring marathon, but a fall marathon again. It would give you a lot longer to prepare and it would give you the opportunity to train for some shorter distance (10k / half marathon) in spring. There are many good runners who follow exactly that approach. They build up their speed on the somewhat shorter distances in one season to then concentrate on a marathon in the other season. 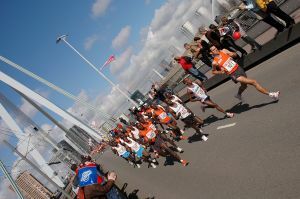 A marathon is, as you have experienced, very painful and a real attack on the body. Jumping into running training only a few days after the event is going to have some repercussions down the track. Your muscles have not healed from your marathon effort, you need to give them some time. You run the risk of getting yourself injured. I recommend a few weeks of rest, with possibly some alternative activities like swimming, a bit of weights, bike riding etc. Enjoy the break from running for a little while. You need to refresh again, both body and soul, before you throw yourself into another tough marathon training program. I advice that you, before jumping into a more tailored running program, you work on establishing a better base during the winter months. I have written an article about it which you can find here. Join in and write your own page! It's easy to do. How? Simply click here to return to Marathon Training Tips Questions.